Here's where to watch every episode of Open All Hours season 2. Mouseover or tap an episode to see where to stream it. Click or tap the play icon to stream it on the best available service. Laundry Blues Mar 1, 1981 Nurse Gladys Emmanuel, having seen Granville struggling with the washing, tells Arkwright that he must buy a new washing machine. Arkwright has to come up with a plan so that she thinks he has done as she requests. He gets Neville to drop off a new machine, sneak round the back of the shop and take it away again, leaving behind a second-hand machine instead! The Reluctant Traveller Mar 8, 1981 Nurse Gladys Emmanuel and Arkwright are finally going to spend the night away at a hotel. Little does she know that the hotel is round the block! Whilst they are away, Granville is entertaining the milk-woman. Arkwright also has a problem with an over-tight money belt! Fig Biscuits And Inspirational Toilet Rolls Mar 18, 1981 Arkwright once again is struggling to sell goods that no-one wants to buy. He therefore tries a special promotion to get rid of the goods, namely fig biscuits and toilet rolls with messages printed on them. The New Suit Mar 22, 1981 Arkwright has to buy a new suit - on Nurse Gladys Emmanuel's say so. Arkwright's Mobile Store Mar 29, 1981 In a bid to prove to Nurse Gladys Emmanuel that he means to expand his business, he buys a van so that Arkwright's Stores can have a mobile store. Shedding At The Wedding Apr 5, 1981 Arkwright goes to a wedding with Nurse Gladys Emmanuel. His suit smells of mothballs and he has to hang his trousers out of Gladys' car to air them. After his trousers are blown away and run over by a tractor, he has to borrow her trousers! 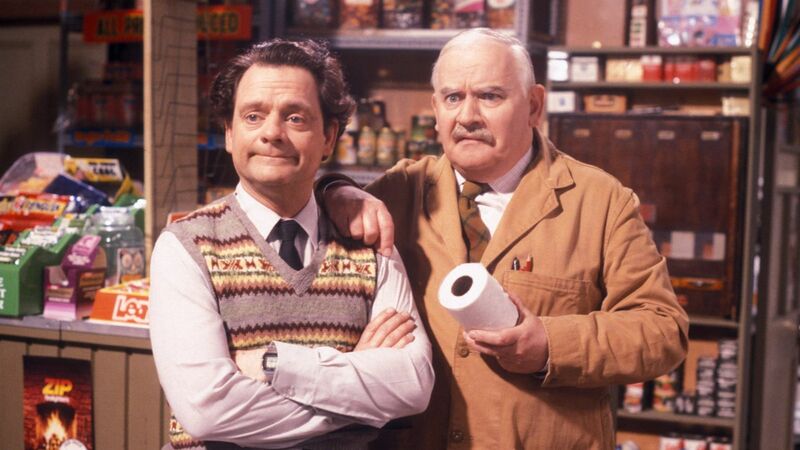 St. Albert's Day Apr 19, 1981 Arkwright invents a Saint's day so that Granville can check the pockets of a foreign visitor who he suspects of shoplifting.